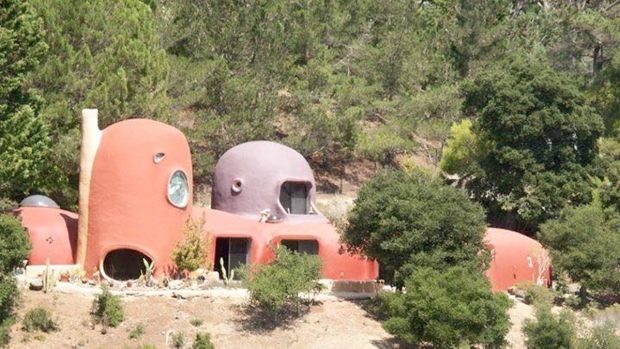 The iconic property known as the Flintstones House has been declared a "public nuisance" by the California town of Hillsborough, and slapped with a lawsuit, but now the homeowner is fighting back with a counter suit, claiming it's a violation of her First Amendment right. The new decorations outside the house — dinosaurs and mushrooms — are at the center of dueling lawsuits between the homeowner and the town of Hillsborough. 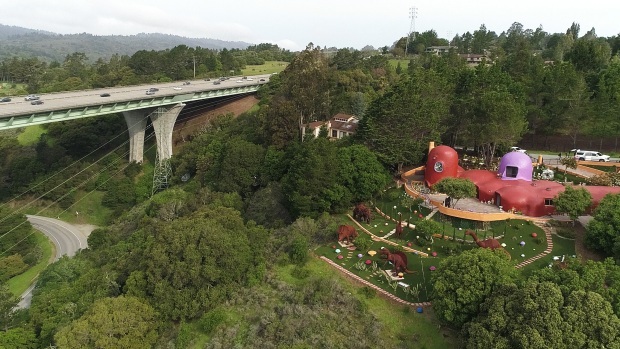 Thousands of drivers get a look at this house off Interstate 280 every day, as they drive up and down the Peninsula. The house itself is not part of the town’s public nuisance lawsuit, it’s all the stuff around it. The decorations definitely catch the eye, as does the giant “Yabba Dabba Doo” sign. That’s what Hillsborough officials don’t like, and they want the owner to screen off the decorations, such as the huge dinosaurs that make the property look like the town of Bedrock. Fang, a media mogul and a prominent member of the Chinese-American community in the Bay Area, has hired the San Francisco-based Law Offices of Mayor Joseph L. Alioto and Angela Alioto to fight her case. 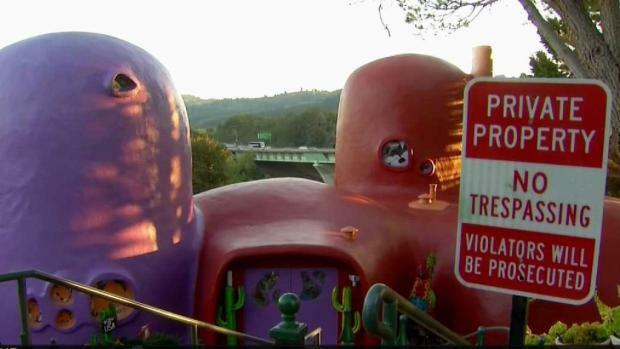 The owner of the iconic Flintstones House is fighting back against a lawsuit from the Town of Hillsborough claiming the iconic home along Interstate 280 is a public nuisance. "Is it really about a dinosaur that they want a tree in front of? Is it really about dino? Fred? Wilma? Or Betty? Is it really about that? Or is it about treating Mrs. Fang differently because she has a dream? And because she’s Chinese and because this is Hillsborough?” attorney Angela Alioto asked in front of reporters on Thursday, while announcing a counter-lawsuit which called the town’s public nuisance lawsuit “harassment,” and possibly racial discrimination. 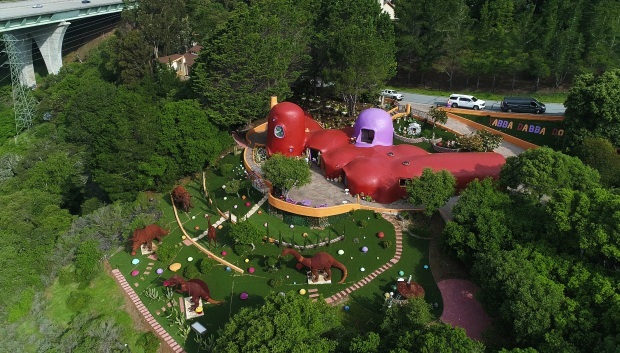 “I think they’re ‘elitists,’I think they really don’t want the Flintstone house, and they don’t want Mrs. Fang,” Alioto said. Fang, 85, points out the property was vacant for two years before she rescued it, and that the decorations are a tribute. Fang says she’s cooperated with the city to make the changes they have asked for but they seemed to move the “goal post” every time. "All I want is a peaceful, happy retired life,” she said. Fang's attorneys called the town's behavior unconstitutional. “We will be countersuing with state and federal causes of action against the town of Hillsborough for what they’ve done to Mrs. Fang," Alioto said. "For what they’ve done to Mrs. Fang and her dream in her own private property, in her own home that is not visible to neighbors. No neighbor has ever complained and they sued her"
Fang has support from the original architect, Nick Nicholson, who admits that in the 70’s he didn’t have the Flintstones in mind. “I think it’s great because it adds this essence of ‘fun,” Nicholson said. For Fang, the house is more than a homage to the popular cartoon series, it's a homage to America. The town of Hillsborough’s attorney adamantly denies any discrimination. The dueling lawsuits will all be set in place within 30 days. Meanwhile, Fang is now preparing a new permit application which means she could still ultimately keep all her decorations. But how much the public will see remains very uncertain.